Konrad Reuland, a former NFL player with the New York Jets, Baltimore Ravens, San Francisco 49ers, and Indianapolis Colts. died Monday, December 12, 2016, at 29 years old from a brain aneurysm. A 6-foot-5 tight end, Reuland signed as an undrafted free agent with the San Francisco 49ers in 2011 after playing football at Mission Viejo High School, University of Notre Dame and Stanford University. Konrad is survived by his parents, Mary and Ralf, and his two brothers, Warren and Austin. Konrad was always committed to mentoring and helping young people fulfill their dreams. He started giving back when he was a student at Mission Viejo High School, in Mission Viejo, California, where he trained and spent his off season helping others succeed. He was a true giver, and left a lasting impact on thousands of lives. 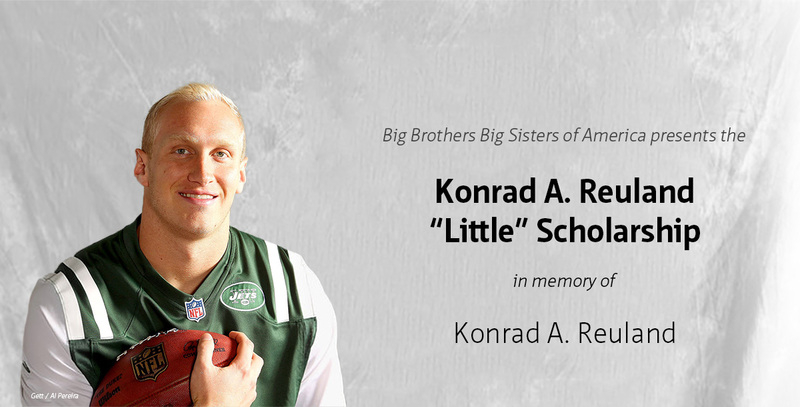 In his honor, his family and friends have established the Konrad A. Reuland “Little” Scholarship through Big Brothers Big Sisters of America. Each year, proceeds from this fund will be awarded to a Little Brother in a Big Brothers Big Sisters program who has an interest in playing football and attending college. Through this yearly scholarship, other young men will continue to be inspired by the life of this outstanding role model.